At a time when several former Soviet republics turned violent (such as Yugoslavia), the former Czechoslovakia also divided, but completely peacefully. Born were the Czech Republic (or “Czechia”) and the Slovak Republic or Slovakia, created with only one point of contention — the Czech’s decision to continue to use the flag of the former joined nation. Since that time, the Czech Republic became a rapidly progressing nation fueled by its prominent Bohemian history, while Slovakia was viewed as being a step behind. That is changing. 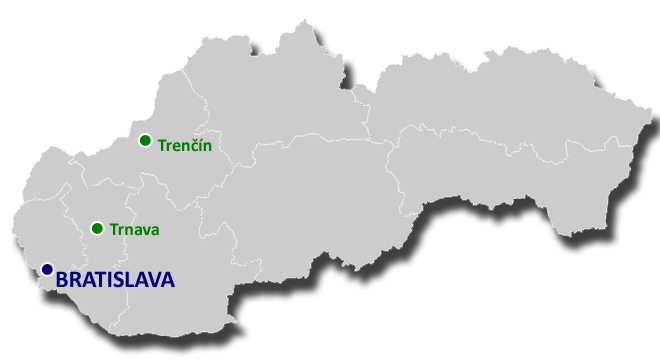 Slovakia is one of the more recent entrants in the European Union with Czech Republic, and its other major border countries of Poland and Hungary. Although much of Slovakia was still agrarian in the 2000s, its capital Bratislava has rebuilt heavily, and its Tatra Mountain regions in the east (part of the Carpathian range) is starting to draw European tourists looking for new and less expensive sights to see. Kosice and the Tatras are the prime entries on my “list” for Slovakia. People have also recommended to me the southeast city of Kezmarok and the Danube region bordering Hungary. I’ve not seen a city where national pride is so clearly on display. The Slovak capital of Bratislava sits on the banks of the Danube just a short drive east of Vienna, and used to be where members of the Austro-Hungarian royalty were crowned, and now sports more flags and national monuments per square kilometer than many capitals. The castle and the old city walls are very well preserved, and the interior of the old town is among the most lively and wonderful I have seen. Other unique structures include the Slavin National Monument and Russian Cemetary over the city and the Novi Most bridge with its flying-saucer shaped restaurant. The northwest corridor of Slovakia is dotted with industrial towns, but among them are some fabulous historic sites that are great excursions from Bratislava. My personal favorite is Trenčín , a wonderful little city with a gorgeous white medieval castle complex overhead and a really pretty downtown. Further south is the enchanting city of Trnava, with its huge market squares and massive churches.